I do apologize for the out of stock items in the pin brushes. I will not be able to restock til maybe June/ July. If you would like an email notice when they become available, do not hesitate to contact me. If you do not have a color preference, grab the ones that are available while they last. 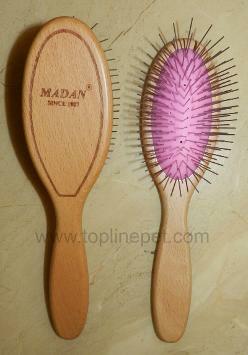 The Madan pin brushes are constructed with a patented design to prevent the pins from pulling out or pushing in. Due to the special design, rubber base stays attached to the brushes solidly. The material of the handle is made of special ABS, with Silicon rubber. The handle follows a Kinesiology design to prevent professional damage. Madan is created & designed by an International Show Judge, Mr. William Lee. Note: There are two holes in the middle of the cushion. This allows flow of air for the cushion, the softer brushes having the most 'give' when brushing. Madan Pin Brushes DO NOT have balls @ the end. This is so the pins can penetrate through the hair, to smooth it out. The pins are beveled @ the ends, so it will not damage the skin. If you need help picking out a brush for your fur baby, please do not hesitate to contact me I will be happy to assist you. Head measures 2.5" across x 4.5" height & has 11 rows of 22mm pins. Total Length of brush is 9". PURPLE (Indigo) is VERY SOFT. It has a lot of give to the cushion. Will not brush out tangles or go through thicker hair. The cushion is that soft, it will just glide over tangles. Ideal for true silky single-haired breeds. APPLE GREEN, BLUE & GREEN have the SOFT cushion. Will not brush out some stubborn tangles. Ideal for true silky single-haired breeds or any of the breeds listed below with silky hair. Also good for Old English Sheepdogs that need to retain undercoat for Show. BABY BLUE, BLACK, PINK, ORANGE, LAVENDER & RED have the MEDIUM cushion. This brush is somewhat firm & will brush out stubborn tangles. It's for silky/ modified & those with soft (cottony), thicker hair. Most of the Biewers & Maltese will fall into this category because of their soft white hair. Ideal for Breeds like: Bichon Frise, Biewer, Chinese Crested (Powder Puffs), Coton de Tulear, Havenese, Lhasa Apso, Maltese, Pekinese, Pomeranian, Poodles, Shih Tzu, Yorkies with thicker soft hair, LH Chihuahua, Japanese Chin, Spaniels, Papillon & Terriers. It's also great for Cats & Mixed Breeds. BLACK w/ RED Cushion has the FIRM cushion. Good for curly, dense, double coated breeds. Ideal for removing undercoat for Big breeds with long, full growing hair like: Afghan Hound, Chow Chow, Collies, Great Pyrenees, Old English Sheep Dog, Retrievers, Shepherds, Shetland Sheepdog & Horses. Breeds listed here can also use Medium pin brushes above. The above is just a guide. These descriptions only apply to the Regular sizes pin brushes. For Smaller pets, please see Small pin brush below. Also called Pocket brush, perfect for the Ring. 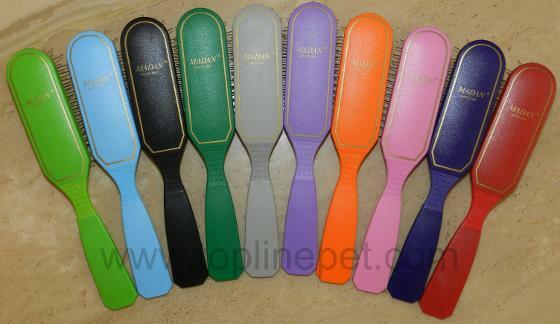 This brush is perfect for smaller breeds (bunnies & kitties too! ), of all hair types, lengths & brushes out tangles easily. Head measures 2" across & 4" height. Has 7 rows of 22mm pins. Total length of brush is 8". Exceptionally smooth wooden handle is made out of Pear wood. Head measures 2" across, 4" height & has 9 rows of 22mm pins. Colored part of cushion measures 1.5" across & 3.25" height. Great for fluff drying & Line brushing. Great alternative to slicker brushes without the scratchy pins. Head measures 1.5" across & 4.5" height. Has 7 rows of 22mm pins. Total length of brush is 9". Head Measures 2.5" Across, 4.5" Height & has 11 rows of 35mm pins. Total Length of brush is 9".